Victoria, Mahe (Seychelles) – March 6, 2018 (travelindex.com) – The news last week that Derek Hanekom had been reappointed Minister of Tourism of South Africa has been well received by the world of tourism at large. We in Seychelles have worked closely with Mr. Hanekom in the past, fostering and nurturing a collaboration between the respective tourism industries of South Africa and Seychelles. In the apartheid era, Mr. Hanekom was imprisoned for three long years, along with his wife, Trish, because they were working with the ANC. I have always been inspired by Derek Hanekom and wish him continued success at the head of South African Tourism. The coveted Best Beaches list for 2018, a Travellers Choice Award, has been published and Seychelles failed to make the cut. Let us hope that Seychelles does not succumb to the truism: “out of sight…out of mind”. All too often a country’s natural assets, such as beaches or pristine environment, are taken for granted. We become complacent and assume that our island Nation’s beauty alone is enough to keep our tourism destination relevant. In the 1980s, Seychelles branded itself as one of the world’s “Best Kept Secrets.” The concern soon surfaced that perhaps our secret was too well kept, prompting the arrival of John Enright of the Irish Tourism Board, who was called upon to relaunch our ailing tourism industry. Mr. Enright brought in an effective group of consultants and launched the successful “Seychelles, Unique By A Thousand Miles” tag line. I joined John Enright as his Executive Assistant and worked by his side for many years. Jamaica is today a tropical island destination that is making positive noise and being seen as the example to follow. Minister Edmund Bartlet is seen everywhere, and his many actions are being well communicated to the world of tourism. His visibility keeps Jamaica relevant and emphasizes the importance of the key Unique Selling Points (USPs) of the island as a tourism destination. The Seven Mile Beach of Jamaica today sits in the World’s 2018 Best Beaches list. Visibility keeps destinations relevant, and it is visibility that helps them to remain the sought after holiday destination. Seychelles has some of the best beaches of the world, and this is well known by each and every Seychellois. 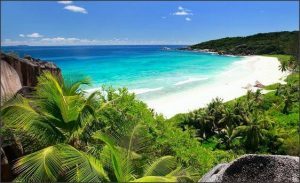 This can remain our little secret, or we change gears and move to let the world know that this is a key USP of Seychelles. International recognised brands spend a fortune in advertising just to remain ahead of the pack. The minute they tamper with the advertising budget, they feel the repercussion in product sales. Importantly, Seychellois must do their part to keep our beaches clean and litter-free. Weekend picnics are the norm, but the evidence of a fun day out is oftentimes left in the sand and in the surrounding shrubbery for all to see. Tourists are often taken aback at the amount of rubbish left on the beaches by careless beach-goers. Le Monde du Silence (The Silent World) is one of the two first underwater films shot by Jean Yves Cousteau, and this one was filmed on our very own Assumption Island, Seychelles. The underwater world of this island became the dream location for this Cousteau film. He was to have filmed at Aldabra, but the underwater turbulence compelled him and his team to anchor the “Calypso” just next door at Assumption. While reputed filmmakers appreciate and distinctly remember the beauty of this island, some of our own Nationals may need some reminding. The Government of Seychelles have entered into an agreement with India to erect a Military Base on Assumption Island. Peaceful protests to this agreement are still rampant in the town of Victoria, with many Seychellois gathering weekly to sign and circulate petitions to dissuade the Government from going ahead with this agreement, especially given that the UNESCO world heritage site, namely Aldabra, is a mere stone’s throw away from Assumption Island. It would appear that approximately 8 out of every 10 Seychellois oppose the proposed military base on Assumption Island, and the 120,000 thousand plus signatures already recorded on the petition opposing that base speak for themselves. The continued battle to preserve Assumption Island has been construed by a cynical few as political manoeuvring. They are lacking the ‘grandeur d’esprit’ to accept that Seychelles still has a very large number of committed and patriotic Seychellois determined to do all what is necessary to protect their islands. It needs to be pointed out for all to appreciate that NO ONE is pointing a finger at India – the effect would be the same regardless of which super power contracted to erect a military base on one of our islands, especially one so close to Aldabra. The Government of Seychelles actively promotes our Blue Economy in the media, but little is being said about the impact that the erection of a military base on Assumption Island and the increased vessel traffic in the area would have on the coral reefs surrounding the island. Seychellois divers are doing all they can to educate the Authorities, the National Assembly Members and the population as a whole, that Assumption Island is worth protecting; we cannot afford to damage any more reefs in our territorial waters (Mahe is a prime example of where extensive construction and reclamation projects have been relentlessly carried out, all but destroying snorkelling opportunities around the island). Aldabra, the unique UNESCO World Heritage Site, is but 20 odd nautical miles from Assumption Island, and increased Military traffic cannot be seen as a plus to this protected Atoll. The risks of oil spillage so close to Aldabra are sure to increase. A referendum on the matter is being called for to give the People of Seychelles a say before our small Nation throws away its Non Aligned principle which resulted in Seychelles being the “friends of all and enemies of none” since 29th June 1976.